Aluminum is fast becoming a sought after metal for marine and automotive applications due to its durability and weight. Not only is aluminum good for the environment (being 100 percent recyclable), the natural protection layer it spontaneously produces ensures that aluminum components are resistant to corrosion in salt water. Aluminum carries a reputation of being hard to work with, but that’s not the entire story. Read on to find out the key elements every fabricator should know when working with aluminum and how you can use it for a competitive advantage. Working with aluminum can be an excellent choice for fabricators looking to keep costs low, ensure a material that is easy to acquire, and keep the product both cosmetically appealing and functional for longer durations in extreme conditions. Read more about this incredible natural quality of aluminum in this article on Corrosion Resistance. Aluminum alloys create even stronger metals with the weight and corrosion resistance benefits of aluminum. With a conductivity rating of 3.5×107 σ(S/m) at 20°C, Aluminum’s conductivity rates close to gold, silver, and copper’s ease of energy transfer. In addition to these three useful properties of aluminum, you can rest assured that it is also a sustainable material that is 100 percent recyclable. PROBLEM: Welding burnthrough happens when the voltage or speed are not in the sweet spot that aluminum welding requires. Did you push too quickly or too slowly? Did you use enough heat or overheat the metal? While a common issue, welding burn through on aluminum is preventable with the proper planning and adoption of best practices in your shop. Some fabricators use waxes or pastes to stop grinding wheels from loading up on aluminum.While this solution does work, it costs extra in materials and time to coat the wheel. In addition, if you are beveling the metal to prepare the surface for a weld, that wax must be removed before you begin welding. Or if you are grinding and blending out a weld, you will want the finished surface clean of the residue. A naturally non-loading wheel, like Rex-Cut’s Type 27 Max Flex Wheels, allows for optimum control and a consistent finish, without the hassle of wheel-coating. See one in action here. Due to aluminum’s reputation in the fabrication world, many companies shy away from using this incredibly beneficial and cost-saving material in applications for lack of 1) knowledge of the aluminum’s propertiesand 2) the right tools to work well with it. The challenges of working with aluminum pale in comparison to its natural corrosion resistance, high strength-to-weight ratio and electrical conductivity. 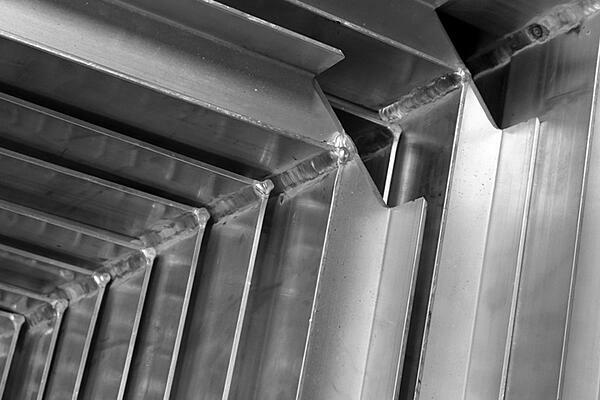 Make sure to review this article regularly to ensure you are implementing best practices for working with aluminum to make your company at the cutting edge of fabrication practices. Looking for more information on Aluminum?